Well, today’s the big day. Call the Shots has it’s official release (although, truth be told, I’ve seen it in a few bookstores recently over the past few days). Still, it’s very exciting that people will be able to trot off and grab a copy of the third book in the series. I feel honored that my release day is sandwiched in between the premiere of the third season of The Voice and the announcement of Apple’s iPhone 5. To all of you who may not have read the first two books in the series, you really can read the books in any order. While they contain some of the same characters, each book is told from a separate point of view and each is a self-contained story. It was more fun writing the books this way as it allowed me to slip inside the minds of three separate guys. Each with their very own perspective on things. People often ask me which was my favorite of the boys but I can’t really answer that question. They’re all special to me in their own ways. That may sound like a cop out but it happens to be true. I’ll leave you with one of my favorite recent pictures. I really think these books look amazing on the shelf together. 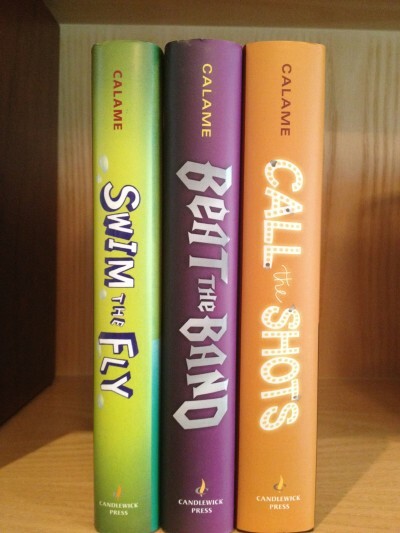 I’m super proud of this series and so grateful to Candlewick Press for publishing them.